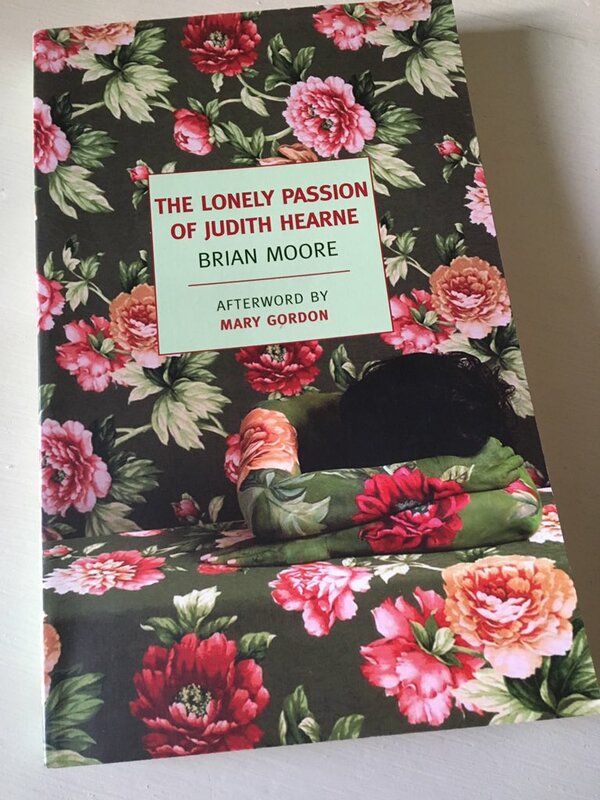 First published in 1955, The Lonely Passion of Judith Hearne is a novel by the Northern Irish writer, Brian Moore. It’s a book I’ve been saving for quite a while, thinking that it might be my kind of read. Turns out I was right, as it’s definitely one of the best novels I’ve read in recent months, if not this year. It also features a rather marvellous boarding-house setting, an element that generally ticks all the right boxes for me. The story itself is achingly sad, a tragic tale of grief, delusion and eternal loneliness set amidst the shabby surroundings of a down-at-heel boarding house in a poor area of Belfast in the 1950s. Its focus is Judith Hearne, a plain, unmarried woman in her early forties who finds herself shuttling from one dismal bedsit to another in an effort to find a suitable place to live. Having devoted most of her adult life to caring for her selfish, somewhat senile aunt (now deceased), Judith is struggling to make ends meet between her dwindling income as a piano/needlecraft teacher and a pitiful annuity from Aunt D’Arcy’s estate. With a limited education and lack of a husband to support her, Judith is not cut out for the working world of the 1950s in which opportunities for women are slowly starting to open up. To make matters works, poor Judith has very few friends – only the O’Neill family whom she visits every Sunday afternoon, an occasion that proves to be the highlight of her week, prompting her to save up various stories to share with the family over tea (more about these excruciating teatimes later). As the novel opens, Judith has just moved into her new lodgings, an establishment run by the rather nosy Mrs Rice who dotes on her lazy, good-for-nothing slob of a son, Bernard, an aspiring but frankly hopeless poet. Also in residence at the house are Mrs Rice’s brother, James Madden, recently returned from America under uncertain circumstances, two somewhat idiosyncratic fellow boarders, Miss Friel and Mr Linehan, and the young maid, Mary. In her desperation and naivety, Judith is rather captivated by James Madden with his tales of America and the hotel business in Times Square. Nevertheless, she knows Mr Madden is likely to find her a dull proposition, especially when they are left alone to make small talk over breakfast – as Judith sees it, he is bound to make his excuses, just like all the other men before him. But, much to everyone’s surprise, James Madden appears to show some interest in Judith, inviting her to the pictures and the occasional outing or two – and before she knows it, Judith is fantasising about a future life with Madden, back at his fancy hotel in New York. As a consequence of her loneliness, Judith is living in something of a dream world, periodically hoping that fate will offer her one last chance at romance and a life of happiness. Little does Judith know that Madden was actually a doorman at the hotel in New York, not a manager or proprietor as she has assumed from his carefully judged comments. To complicate matters further, Madden is also under a misconception about Judith, imagining her to be wealthy and knowledgeable from the jewellery she wears and her interest in America and the broader world in general. In light of this belief, Madden is hoping to ‘play’ Judith by persuading her to invest in his new business venture: a plan to open a US-style hamburger joint in the middle of Dublin to tap into the tourist business. However, while Judith has very little money of her own, she does harbour a terrible secret – a private passion which she tries, somewhat unsuccessfully, to keep under wraps. When Judith’s dreams of a future with James Madden start to unravel, the true nature of her troubled inner life is revealed. The humiliation that follows is swift, unambiguous and utterly devastating, leading to significant tensions and gossip in the house. As a consequence, Judith seeks solace in the Catholic Church, her one guiding light during the many years of darkness. But when the priest on duty fails to grasp the true gravity of her concerns, Judith’s faith in God begins to fracture, adding considerably to her sense of desperation. It’s a testament to Moore’s skill and insight as a writer that one can really sense the overwhelming nature of Judith’s anxiety when her religious conviction is put to the test. With her belief system in tatters, Judith turns instead to the people she has always considered to be her true friends, the O’Neills. In reality, however, the O’Neills dread Judith’s Sunday afternoon visits, making fun of her behind her back and arguing over whose turn it is to do their duty that week. In her heart of hearts, Judith knows that she is thought of as a rather fussy and silly old woman, especially by the younger members of the O’Neill family, Una, Shaun and Kevin; nevertheless, in spite of this, she still believes the O’Neills are kindly people, even if they understand little of the realities of her life. Moore injects these ‘teatime’ passages with considerable humour, but it is a painfully dark kind of humour due to the tragedy and narrowness of Judith’s world. As the novel reaches its shattering conclusion, Judith’s mind begins to spiral out of control as she loses her grip on reality. Without wishing to give too much away, there is a certain inevitability about the story which comes full circle towards the end. We see Judith adopting an air of resignation in her new home, another room in which she carefully places the two symbols that follow her everywhere: the silver-framed photograph of her aunt and the coloured oleograph of the Sacred Heart. As readers, we can only imagine what the future may hold for her. The Lonely Passion of Judith Hearne is an outstanding novel (probably one of my top three for the year), but it’s also a devastating read. The characterisation is truly excellent, from the nuanced portrait of Judith, complete with all her flaws and complexities, to the immoralities of James Madden and Bernard Rice. (In a novel not short of damaged and dishonourable characters, James and Bernard definitely stand out.) It’s also beautifully written, a heartbreaking paean to the loneliness of a life without love. Very highly recommended indeed. This entry was posted in Book Reviews, Moore Brian and tagged #ReadingIreland, Boarding Houses, Book Review, Brian Moore, Classics Club, Fiction, Ireland, NYRB Classics on November 27, 2018 by JacquiWine.